A greeting from the Miami Valley Association of Volunteer Administrators! 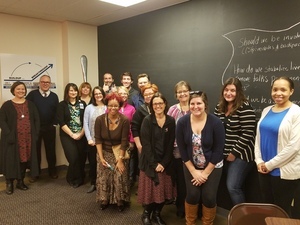 I am the current president Nick Eddy, of the Volunteer Connection office at United Way of the Greater Dayton Area. I am very happy to be president of MVAVA for this current stretch, as the group has been invaluable to me for both education and networking since I joined the non-profit world a few years back. I have scarcely ever met a more welcoming collection of people – always willing to share information, introduce a contact and laugh over lunch! This year we are again meeting every third Tuesday (next month will be April 18th) at the Foodbank (56 Armor Place, 45417). Please come out and join us! For instance, for our March meeting we had a terrific presentation from local volunteering legend (I said it, she didn’t!) Nikki Winner, who is CVA-certified and who spoke on “Dating Your Volunteer.” Not how it sounds! She gave great tips on how to make your volunteers feel wanted and welcomed, and how to be get that volunteer you really need to keep coming back. Also, great coaching on those first introductions to make one’s volunteer opportunity appealing in the face of so many other choices. Hmm, maybe it was like dating. Regardless, the entire group took lots of notes and really enjoyed themselves! Come visit next month and see how these presentations can add to your skill repertoire. Oh! We are extending membership renewals through April 30th, SO if you/your organization are a continuing members but have not renewed for 2017, please do so at www.mvava.org. Membership runs $25 a year for individuals, $60 for small organizations (up to 5 members)…also, please feel free to bring or send a friend for their first meeting for FREE (additional one-off attendance after the first free one costs $5). Membership information will also be available at the meetings proper. I look forward to seeing you all at our next meeting!